Henry James managed to overlook typographical errors in his text while concentrating on the serious business of removing commas which the printers had inserted (and some of his own).1↤ 1 See H. K. Girling, “A Toot of a Trumpet against the Regiment of Editors,” Bulletin of Research in the Humanities, 81, iii (1978): 297-323. William Blake while revising and reorganizing his text managed to overlook cumbrous redundancies—two “Chap: IV” headings in The Book of Urizen, two of “Night the Seventh” in The Four Zoas. Neither writer should be thought to have “abandoned” his works. Perhaps Blake as his own printer (or scribe) might have settled the fate of all those dangling insertions and the two chapter headings if he had lived to inscribe one more fair copy. We shall never know. And we tend to forget that we cannot know how many drafts and revisions and fair copies were made and discarded before the assembling and inscription of the surviving manuscript of The Four Zoas, although it is built on the remains of several fair copies beginning with the one dated “1797” and patched even after the etching of his other epics. When we come upon the insertion of a reference to annihilation of the Selfhood, we may think we are witnessing the dawn of that concept in Blake’s mind: we should allow for the possibility that he had already written his Milton. When we debate whether to move the parts or the wholes of the two Nights the Seventh from their positions “in the manuscript,” we forget that Blake did not number his pages (beyond “14” in the first Night) and that the manuscript was a heap of unbound and unsorted sheets when the Linnell brothers lent it to the first editors, Ellis and Yeats. “An attempt had been made to put it in order, but without success,” records Ellis. “The arrangement of the loose sheets occupied us during several long days” (The Works of William Blake, ed. E. J. Ellis and W. B. Yeats, 1893, II, 300). It has been traditional to scoff at the editorial casualness of Ellis and Yeats, whose transcription of Blake’s words is full of howlers. It has not been recognized that the sequence of pages we accept today is pretty much that established by Ellis’s arrangement, not over those several days but over several years. Many of the sequences were fairly easy to discover, with the help of Blake’s occasional catchwords, his handwriting sizes, his counting of lines by tens and fifties and by Nights, as well as the frequently incontestable narrative flow. But most of these aids are lacking for the area of the present investigation. Here editors are often entirely on their own, attempting by conjectural leaps and plodding deductions to trace the intentions of the apocalyptic imagination. Bentley’s conclusion (p. 197) that each editor is “at liberty to rearrange the leaves as seems best” cannot be taken as a serious generalization, but is practically operative for Night VII. How did the two Nights the Seventh survive? Were they together when Blake turned over the heap of unbound separate leaves (half-sheets) to John Linnell? Had he placed some leaves at the bottom of the pile? Let us consider what Ellis found for evidence of order in the manuscript pages of what we are calling VIIa2. The three leaves bearing the pages now numbered 85-86, 87, 90 (in our editions, not in the manuscript) were not found where we think they belong. Ellis at one stage considered pages 87 and 90 as part of “5th N[ight]” and tried p. 87 as “p 3” and p. 90 as “p 4” of that Night. Later, assembling the leaves bearing pages 90, 87, and 86, facing versos up and in that order, Ellis numbered them 1, 2, 3 and queried the first (p. 90) “?fragment 7th (1).” Before press time Ellis and Yeats had assembled and paginated the first ten pages of VIIa and had discovered that the text on 86 (their page 10) follows from the text on the other side, i.e. 85 (their page 9).2↤ 2 The Ellis and Yeats edition, 1893, numbers lines Night by Night and does not indicate manuscript pages, but the textual sequence is that of the first pencilled series of folio numbers in the manuscript, running from 1 to 68. The texts of pp. 15-16 and 111 are given in an Appendix of “fragments.” Some indication of the ordering problems faced by Ellis and Yeats is given by the queries on the leaves of VIIa2 trying them for Night V, then as a misplaced “fragment” of VII, and by the numbering of some Nights by leaves (“sheets”) and by pages. Night V apparently gave difficulty, with some sheets facing wrong side up; the only number on the proper 4th page is “6” (p. 60) and p. 62 was once numbered “5” then “6”—possibly when pp. 87 and 90 were queried “5th N p. 3” and “5th N p. 4.” The 9th page has “8” changed to “9.” Finally the proper sequence of leaves 2-5 was marked as “sh2,” “Sht 3,” “sht 4,” and “5th sheet,” in pencil notes (partly erased) that seem to cite “cat. Ellis”: perhaps Ellis had made some sort of catalogue of sheets which could be consulted when reshuffling had caused disarray. (It must have been later that these five leaves were heavily designated “Book 5 Page 1” etc., with “Book” only twice corrected to “Night”—or can these heavy markings have been Blake’s own, whose heading for this Night first read “Book”? The g’s are more like Ellis’s, but I am uncertain.) Night VI was also marked by sheets, 2d, 3d, 4th, and 5th, correctly, but only the first three pages were given numbers: did doubts remain, or had the problem vanished? Night VIIa was paginated up through “11” (p. 87) and “VII” was written beside Ellis’s “?7th (3)” query. Ellis queried “?what night?” at the top of p. 97, but by press-time had taken the plunge of including the sequence we think of as VIIa and VIIb as a single Night. We do not know where the parts had been found—except that they had not been found together and that VIIa1 and a2 had not been together. It was not hard to see “what night”[e] p. 97 belonged to, since its verso bears the unerased legend “End of The Seventh Night,” and we find a revealing outcry in Ellis & Yeats (III, 173): “Line 786 [95:14] is the only possible end of Night VII” (accepting the transposition of the halves of VIIb). This declaration solved the editorial problem, and pp. 78-98 were printed as a continuous Night. But the failure to paginate VIIb may indicate lingering reservations. Night VIII presented no difficulty, except that leaves 56 and 57 were not included in the text until after page numbering—and that the concluding page was not numbered. Night IX has page numbers that only begin with “5” but run correctly to “20” but then jump to “27” followed by “27,” again, with no number on the final page. How can we be sure that Edwin J. Ellis wrote these queries? For one thing, they clearly precede the ordering decisions reflected in the 1893 edition. For another, Ellis identifies the handwriting by initialing and dating a longish note on page 15: “(a separate sheet. It cannot be placed as its sequel is missing. )—E J E—1891.” The letters, especially the g and t, are distinctive and are identical to those in the word “fragment” on p. 90. Thirteen years later Ellis adds a further note below it: “Perhaps it is all an insertion designed to preceed ‘Enion blind & age bent wept upon the desolate wind, [line] 373,—in the 1st printed numbering [i.e. the 1893 text]—Suggestion of Mr. F G Fleay 1904” (i.e. Frederick Gerard Fleay, 1831-1909, editor and poet). These notes tell us why pp. 15-16 were kept at the end of the Ellis-Yeats text as “fragments” (along with p. 111, also unplaced). And apparently Fleay’s suggestion was too late for the Ellis 1906 edition, in the press by 1904. Actually both pp. 15-16 and p. 111 remain in the Keynes Bibliography (1921) as “additional leaves and fragments” foliated “69” and “70.” Sloss and Wallis finally put both these stray leaves into proper places though they continued some of the confusion of sequences in Nights I and II. For example, the order now accepted, of pp. 18, 21-22, 19-20, was arrived at by much editorial agony. If Ellis had managed, accidentally or with care, to put the leaves in that order, subsequent editors instead of weighing and reasoning might have felt they were merely “retaining the manuscript order.” Perhaps it should be noted that the pencil foliation that runs from 1 to 68 corresponds to the Ellis-Yeats sequences, while the revision that runs to 70 is made after insertion of pp. 15-16 as folio 8 and of pp. 111-12 as folio 56, with the numbers moved forward one after “8” and two after “56.” Subsequent editors (perhaps Ellis in the first place) confirmed the sequence of pages 77 through 85 by Blake’s own line-counting—but not quite. Margoliouth and Bentley noticed evidence of a potential gap between 84 and 85, but quickly dismissed it. Blake’s pencilled line-count at the bottom of p. 84 (“292 or 297”: the poet hesitating whether to keep or cancel five lines of his marginal insertion preceding the last two lines of the page) must signify, judging from his other totals at begin page 136 | ↑ back to top ends of Nights, that he considered 84:42 as the end of a Night; there is certainly sufficient cadence. Much later (according to Margoliouth and Bentley) Blake’s numbering in ink by fifties produced a line-count of “350” (mended, however, from “370”) alongside line 12 of p. 85 (line 8 before insertion of lines 1-4). When Blake made that count he had extended the Night beyond the 292 or 297 lines of pages 77-84, presumably on an intervening leaf containing from 46 to 71 lines (depending on how many of the inserted lines on 84 and 85 he included in his count). The insertion of 85:1-4 could have been made to bridge the gap made by removal of the leaf. Margoliouth simply notes that “no lacuna is indicated by the sense” (but of course) and rules that “Blake’s ‘350’ must be meant for ‘300’.” His confidence derives from the consideration that “a lacuna would mean a whole leaf missing with 50 lines (far too few for two pages)”—and from neglect of the fact that some pages have pictures (76, for instance) that take up space. Bentley (pp. 199, 204) repeats the argument: “a missing leaf would probably have about seventy lines on it.” Neither Bentley nor Margoliouth was influenced by the mending of the numeral from 370 to 350, which they did not observe.3↤ 3 Margoliouth (p. 133) does note the mending but takes it as 350 “perhaps imperfectly corrected to ‘300’.” I need another look at the manuscript. Confident that there can’t be 50 lines missing because there would have to be 70, Bentley fails to consider that Blake could have written 70 lines and cancelled 20. Blake’s way of working must often have resulted in leaves removed or moved to other positions. I have no hypothesis about the missing leaf, but perhaps Andrew Lincoln can evolve one that suits his hypothetical reconstruction of the movements of parts of Night the Seventh. Until getting involved in the present discussion, which has been going on for a couple of years, I tended to assume that leaving the manuscript “as it was” meant accepting the order VIIa, VIIb. I have come to realize that there is even less evidence for doing that than for relegating one Night the Seventh to the bottom of the pile. There is evidence, we see, for concluding that Blake, with at least temporary intent, sidetracked VIIb when he inserted VIIa2 as a firm piece of masonry fitting VIIa directly to VIII.4↤ 4 A misreading by Wagenknecht, followed by Kilgore, of my textual note (Poetry & Prose, p. 758) referring to additions on pp. 87 and 90 that tighten the sequence to VIII as a bit of masonry makes for some mirth at that lunatic Erdman who sees masonry in a misfitting conjecture (they take me to refer to possible use of 87-90 as an insert on p. 100). I didn’t, of course. But I do write difficult sentences. Recently Robert Essick (in Blake 43, p. 181) joined Gerald Bentley in misreading my shorthand attempt to define the gesture of the angel embracing “All Religions” as “with arms around stone tablets . . . and a bearded priest . . . ”; I seemed to be saying that the arms were around the tablets only! (The Illuminated Blake, p. 24) There is also evidence, in the fact that Ellis found pages 85-90 not obviously “in” Night the Seventh at all, that Blake may have removed the masonry unit of pp. 85-90 (all of 7a2 and its bridge from 7a1) to leave open a sequence from 84 to 91—or to 99. Ellis does not give page numbers to the pages of 7b and clearly did not find it “in place” either. What finally decided Ellis and Yeats was there being only one terminal rubric “End of The Seventh Night,” the one on p. 98. We all seem to agree that no part of VIIb nor VIIa should be discarded. Blake left no instructions—to himself or posterity—for their arrangement, and those of us who have become familiar enough with the text to face the problem of its arrangement already “have” both Nights, whatever order we read them in. The editorial problem remains: to choose a sequence which will work best, in the context of the whole poem, for the new or the occasional reader.5↤ 5 The ideal edition for scholars will be a photographic and typographic facsimile, with better photographs, and transcripts freed of the misleading features of the Margoliouth and Bentley editions. New photographic techniques may one day restore the erasures and palimpsest to legibility. The transcripts should not confuse fair copy and palimpsest, as Bentley’s do. My editorial self has been moved by the present discussion, further homework, and discussions with John Grant and Harold Bloom, to abandon those non-solutions, the relegating of VIIb to a postscript or the printing of VIIa and VIIb in tandem. Neither arrangement responds adequately to the manuscript or to the reader’s appreciation of an inclusive yet coherent narrative or thematic sequence or structure. As the search for Blake’s “final intentions” disappoints us, we arrive at the idea that the best editorial service will be to place VIIb in the most effective location within the flow of the text. Even the graphic evidence contradicts itself: Blake left two ornamentally lettered headings, “Vala / Night the Seventh”—but he left, as Ellis noted, only one “End of the Seventh Night,” at the conclusion not of VIIa but of VIIb! Perhaps the greatest liberty to be taken in accepting the textual masonry cementing VIIa to VIII will be our snatching the finis line from page 98.6↤ 6 No editor, so far as I know, has felt guilty about ignoring Blake’s own page numbering in copies of Urizen that put Plate 8 after Plate 10, and we all restore the rejected Plate 4. Incidentally, my note on p. 727 contains a howling non sequitur. In support of the hypothesis that Plate 8 was designed to replace Plate 10, I argue that in two copies the lines on Plate 10 that contain the refrain words “first Age” are marked for erasure. The evidence rather supports the contrary view, as I ought to have seen, that Plate 10 was meant to be kept. I report this somewhat in the spirit of Charles Lamb hissing his own farce. Ellis’s point was in justification, not of printing two Nights Seventh but of conflating them as one. As I understand Lincoln’s reconstruction, there was once this sequence, before revisions: 6 ° 7a1 ° 7b1 ° 7b2 ° (+) 8. There was never the bewildering non sequitur either of 6 ?! 7b1 or of 7b2 ? 7a1. Then, when Blake transposed the halves of 7b, by his inked instructions, a fairly abrupt but obviously tolerated linkage resulted: 7b2 °! 7b1, the aim perhaps being to link 6 + 7b2 ! 7b1 + 8 and to eliminate 7a, which consisted entirely of 7a1. The reversal made a poor linkage of 7b1 ? 7a1, if he meant to retain 7a between 7b and 8; on the other hand 6 ° 7a1 + 7b2 was not impossible. But then Blake added 7a2, confirming the retention of 7a but making a place for it problematic What were the possibilities? To retain 7b with either part of 7a would be difficult. 6 + 7b2 ! 7b1 ? 7a1 ° 8 would produce a bad sequitur. More successful would have been the sequence 6 + 7b2 ! 7b1 + 7a2 + 8, although the tidiest set of transitions (disregarding structural omissions) would have been: 6 ° 7a1 ° 7a2 + 8, dropping 7b altogether. Lincoln’s suggestion: 6 + 7b2 ? 7a1 ° 7a2 ? 7b1 + 8. Kilgore’s main suggestion: 6 ° 7a1 ° 7b1 ° 7b2 ! 7a2 + 8. Lefebvre’s suggestion: 6 ° 7a1 + 7b2 °! 7b1 + 7a2 + 8.
begin page 137 | ↑ back to top Lincoln would revise the ? between 7a2 and 7b1 to ! by restoring the word “Now” to 91:1 (which Blake may have misquoted as “Thus”). The sequence he proposes makes good sense as a conclusion from his analysis of the probable evolution of the extant texts. And it preserves the linkage made by Blake when he added 7a2 to 7a1, while it only moves further apart the halves of 7b which Blake had already rearranged. But the proposal to fit VIIb between the two parts of VIIa seems to make the better reading sequence. Between the Kilgore alternative, to restore b1 and b2 to their earlier order, and the Lefebvre alternative, to retain the reversed order called for in the manuscript, I incline to prefer the latter as doing the least injustice to the claims of narrative and the manuscript evidence. And on that point Kilgore agrees, if we are talking about a published edition.7↤ 7 What I have called Kilgore’s main suggestion is what he recommends as “a critical order” to be followed in reading, the order used by Wagenknecht. Kilgore would, however, “print VIIb in the reversed order.” When he is considering a printed text he is guided by the policy of “following the latest intentions for which there is direct evidence in the manuscript”; when recommending the original order, for reading, he is guided by a suspicion “that the reordering of the Night corresponded to a plan of revision which Blake never carried out.” These are proper distinctions. I find myself concurring (for a printed text) with the “direct evidence” rather than the suspicion; what I am less certain is that presenting each Night Seventh as a unit must be “undoubtedly correct.” The discussion, the evidence and the considerations brought forward, have inclined me to doubt that Blake’s manuscript, not known to have been in its present bound order, makes it feasible to present each of the two Nights Seventh “as a unit” while attempting to preserve the unity of the entire poem as comprised of nine Nights. Harold Bloom, whose Commentary (as he points out) will work quite well when rearranged, agrees with me that most people reading the poem will find it more available in this form—and that no editorial handling, in any case, can possibly acquaint the reader with the full nature of the editorial problem, let alone the “manuscript evidence.” Perhaps it tells us something about the sequences of the text, as well as about Bloom’s Commentary, that we can easily see that rearranging will cause no difficulty and, indeed, will give the reader a stronger epic sequence. “You must state, though,” says he, “that we really do not know how Blake perceived narrative continuity, how much departure from the Homeric norm he felt comfortable with.” Ault’s theory, that Blake as it were got a twentieth-century charge out of narrative discontinuities, is of course somewhat anachronistic.8↤ 8 Donald Ault, “Incommensurability and Interconnection in Blake’s Anti-Newtonian Text,” Studies in Romanticism, 16 (1977): 277-303. Yet there is much wisdom in Ault’s analysis of what is happening in The Four Zoas. “The basic formula . . . is: incommensurability does not entail disconnection; and interconnection does not entail unity” (298). “From the opening of the poem Blake has been striving to dissolve a solid framework right before our eyes. . . . The final version [of Night the First] frustrates all attempts at causal connection by deleting the predicate forms which allow the language to be divided into causally related phrases” (299). Even so, Night I, heavily and rather carelessly patched (to judge by Blake’s general practive elsewhere in the poem), is a special case, not altogether relevant here; and Ault at times misreads to find his “inversion or reversal of narrative ‘facts’”—as in the evidence he produces on p. 282 from pages 4 and 22. Tharmas’ saying that he bears pity to Enitharmon, who “hath taken refuge in my bosom” (p. 4) will appear to be reversed on p. 22, “And Tharmas took her in pitying,” only if the reader chooses to misconstrue by attaching the “pitying” to Enitharmon and not Tharmas. A witty fellow can do this with many a text but cannot convince us that the author or his contemporary reader would have faltered into such misprision. Mitchell is perhaps closer to Blakean thinking when he argues that “Blake intentionally designed Jerusalem to allow only an approximate sense of structural orientation” as, in part, a rhetorical strategy.9↤ 9 W. J. T. Mitchell, Blake’s Composite Art (Princeton University Press, 1978), p. 215. I have talked too much about “narrative sequence” perhaps; the linkages I have diagrammed as ! and + and ! do not threaten to order Blake’s text into anything tidier than what Mitchell calls “approximate structure and centripetal focus.” Not that Jerusalem and The Four Zoas have the same shape; nine Nights are round and they revolve, while four Chapters reverberate. The question of the earliness or lateness of VIIa “taken as a whole” has been quite sufficiently flogged, but I feel some responsibility for the confusion. My note at the head of VIIa should not have read “Written later than and presumably to replace Night Seven b” but something like this: “Nights VIIa and VIIb were at one stage a continuous pair of chapters with identical titles. Additions were made to VIIa (on pp 85-90) which linked it directly with VIII. Blake left no instructions for relocating VIIb; it is here given following IX.” But once the discussion gets down to the lateness of VIIa1 ° 2, most of the disagreement vanishes. As Kilgore says, ceasing his heavy fire, “the traditional account . . . may not be so far mistaken after all. . . . Thus VIIa [he means 7a1] though not originally a replacement for VIIb, would have become one by the time Blake finished his revisions [i.e. added a2].” Q.E.D. He even comes round “tentatively” to the thought that “Blake changed the order of VIIb before writing [VIIa2].” So we can “break through” to where the discussion should have begun. I cannot believe that Margoliouth’s observation of the narrative continuity of a1 ° b1 was news to anyone working on the text; I find no excitement about it in his correspondence with me when he was preparing his edition. The textual question was whether Blake’s revisions culminated in a “structure which Blake finally left . . . with VIIb lounging somewhere in the shadows” (Kilgore’s language as he puts up his sword). The stitch-mark argument is threadbare now; as Kilgore says, one hypothesis “is not more convincing” than the other; neither accounts for the narrative continuity, which in either case can be accounted for by several hypotheses. That was my point in my “Binding” review of Bentley’s Vala. You test a theory by seeing if it withstands assault; since Bentley hadn’t tried, I did. But the reactions of Kilgore (and Wagenknecht, whom he quotes) tell me that I overdramatized the criticism. Bentley had enlivened his bibliographical prose by declaring that Erdman had “gambled heavily . . . and lost a sizeable proportion of his shirt” (p. 168). Bentley was right, except perhaps in his proportions, but some of his dating evidence was left without a stitch. His theory of “anomalous” leaves, rather arbitrarily defined, put seven late pages into VIIa and only six early ones; it seemed a hypothesis that just got in the way. I was testing the structure of his argument, not building one of my own. Lincoln, now, makes a carefully elaborated extension of Bentley’s valuable suggestion that VIIb was matter displaced from VIII. Lincoln’s tracing out the probabilities of a coherent evolution which involves VII in relation to the whole, especially the additions and changes in IV, VIII, and IX, I find generally plausible, often convincing, and elegantly handled. His sigla (VIIa, *IX, etc.) are clear and keep us aware of moving in a world of hypotheses. But I am uneasy about some of his arguments that appear to assume the possibility, where it seems slight, of distinguishing plot requirements from changing intentions. We are all guilty at times of confusing time of conception or composition with time of inscription; he appears to be doing so when he finds a “reassessment of the role of Los” in “late” passages (or takes it as evidence of lateness: just which, is not always clear). 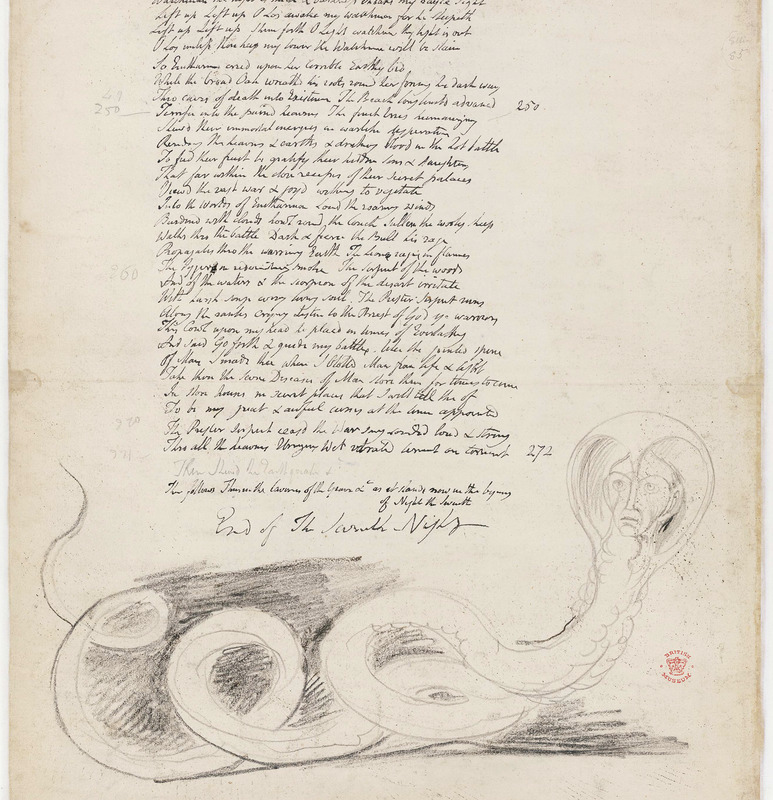 The “tension rather than cooperation between Los and Enitharmon” which Lincoln sees as characteristic of Los before a reassessment interpreted as a product of Blake’s changes of thought in 1803-04 is not unlike the tension between Los and Enitharmon that occurs in Jerusalem as the poet’s song “draws to its period” (see J 83-88). No one has suggested—but perhaps someone should—that Blake underwent a reassessment of Los while composing the final plates of Jerusalem. This is not a proper occasion to argue about the conversions of William Blake, nor about the roles of Los or Orc or the shadowy Female who has found him and will not let him go, in the America Preludium. The revolutionary embrace (of 1776/1793) is surely not presented as an act of jealous possession; yet possibly Andrew Lincoln is right to read the Preludium as equivocal. The Four Zoas, p. 98 (detail).